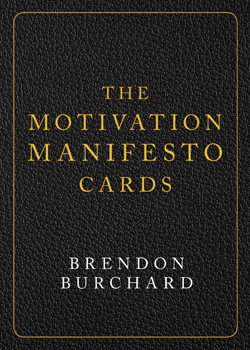 After spending more than a dozen weeks on the New York Times bestseller list, The Motivation Manifesto now delivers its inspiration through this beautifully designed deck of 60 cards that collects the most invigorating quotes from the book. These are just a few of the invigorating quotes pulled from the New York Times bestseller by world-leading high-performance coach Brendon Burchard. With this attractive deck of 60 cards, readers will always have a burst of inspiration ready in the palm of their hand. Brendon's pulsating words, inspired by the rhetoric of revolutionaries throughout history, will get readers on their feet and moving with the greatest motivation known to humankind - the desire for more personal freedom. That march to personal freedom, Brendon argues, can be won only by declaring our intent and independence, stepping into our personal power, and battling through self-doubt and the distractions of the day until full victory is won.